CERTAIN KING took account of his servants and began to reckon what they owed him. And there was brought to him one that owed him nearly ten million dollars. But as he had not the money to pay, the King commanded that he should be sold, together with his wife and children and everything that he had, that payment might be made. Then the servant fell down before the King and worshipped him, saying, "Lord, have patience with me, and I will pay thee all." Then the King had compassion on his servant, and loosed him, and forgave him his debt. 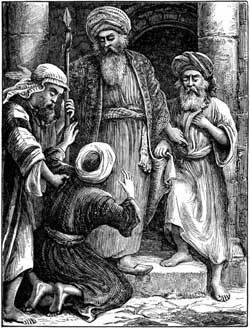 But when that servant had gone out from the presence of the King, he found a fellow-servant who owed him a little over fifteen dollars, and he laid hands on him and seized him by the throat, saying, "Pay me that which thou owest." And his fellow-servant fell down at his feet and implored him, saying, "Have patience with me, and I will pay thee all." And he would not have patience, but cast his fellow-servant into prison till he should pay the debt. When his other fellow-servants saw what had been done they were very sorry, and came to their King to tell him all about it. Then the King called the unmerciful servant to him, and said, "O thou wicked servant; I forgave thee all that debt, because thou desiredst me. Shouldest not thou also have had compassion on thy fellow-servant, even as I had pity on thee?"